How can I convert an IFO file to MP4 video? "I have an old TV series saved up in my PC on which each episode has IFO & VOB files. I want to convert it to a MP4 file to be able to watch it on TV via my media player or burn it onto a DVD. Is there a way to convert IFO to MP4?" Open the VIDEO_TS folder you have backed up from DVD. You can get so many files with 3 different extensions: .IFO, .VOB, and .BUP. As above questioner, some of you may require converting IFO file in the folder to MP4 for playing with media players, portable devices or more. Here, we will give a full explanation of how to convert IFO to MP4 while keeping original quality. IFO files store all DVD information including titles, menus, chapters, volumes, multiple languages, subtitle, audio tracks and so on telling DVD players where movie or TV episode starts, where to control playback settings etc. IFO files are required on DVD disc with VOB and BUP (backup copy of IFO) files having DVD players open DVD video normally. As for converting IFO to MP4 for later playback or DVD burning, it means that you should rip the whole VIDEO_TS folder which contains IFO files to a MP4 video for getting an output file with complete DVD video content. 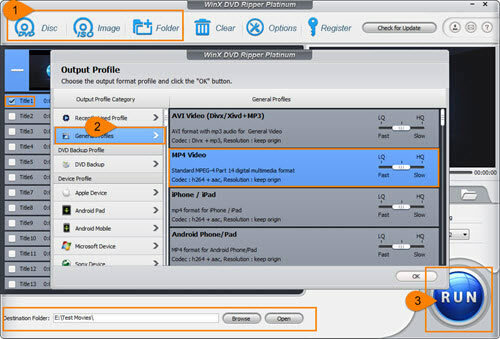 It turns to be an easy mission with the help of a competent IFO to MP4 converter. WinX DVD Ripper Platinum arrives to help you solve all problems. Concentration all on DVD ripping, this program supports all formats saving DVD video content, including DVD disc, VIDEO_TS folder and ISO Images. Built-in hundreds of video/audio codecs, it can easily convert IFO files to MP4 (H.264) and other mainstream formats like AVI, MOV, FLV, 3GP, WebM, MPEG2 and more. Although copy protections on DVD contents may stop you making a MP4 copy from IFO file, WinX DVD Ripper Platinum can successfully circumvent special schemes (e.g. CSS, region code, FBI warnings, Sony ArccOS, Disney DRM etc.) on latest released movies, workout DVDs and others. This WinX IFO converter also features lightning speed. The support of hardware encoders (Intel QSV, Nvidia NVENC), plus Super Encode Engine, Hyper-threading tech and Multi-core CPU utility, make it reach an unexpectedly speedily conversion, about 10 minutes to convert a feature-length film (depending on your computer CPU and DVD drive). Additionally, preset MP4 profile has been defined to output possible highest quality so that you can get a resulting MP4 video with images/audios as original as source IFO file. It's time to download and install WinX DVD Ripper Platinum on your computer. The Windows version is fully compatible with Windows 10 and lower and Mac version can run well on macOS High Sierra (10.13) and lower version. Launch this WinX IFO to MP4 converter and click + Folder button. A small dialog box pops up, click Browse button to select the DVD folder with IFO files you want to convert to MP4 and then click OK.
A couple of seconds later, all titles are loaded and main title is automatically checked. Meanwhile, Output Profile window appears. Move to "General Profiles" located at left side of the window and then select MP4 Video (codec: h264+acc) as output format. Click OK. If necessary, you can click Browse button to set a new destination folder to save the resulting folder. Finally, click "RUN" button to start converting IFO to MP4. After the conversion process is completed, the destination folder will pop up showing you the converted MP4 file. Now, you can play it with any media player, upload it to YouTube and alike, as transfer it to iPhone, iPad for movable playback. Part 3How to Convert IFO to MP4?